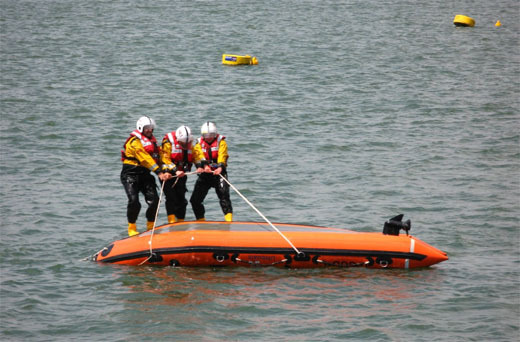 Boat capsizes are actually more common than you realise. If you are a small vessel operator, whether power or sail, then it is a good idea to be prepared for this type of emergency. Why Has My Boat Capsized? A boat is called “capsized” when it has overturned or is floating on its side. Smaller vessels are more likely to capsize due to their sensitivity to sudden changes in wind and sea conditions. Luckily, most boats will remain floating in the capsized position, enabling you to be supported by them on the surface. Boats often capsize when overloaded, in heavy seas or adverse weather conditions, or if pushed beyond their design limits. What Should I Do If My Boat Capsizes? If your boat capsizes then the most important thing to do is remain calm and conserve your energy by floating. If you have passengers or crew then take an immediate head count and ensure everyone is wearing their lifejackets and stays next to the boat. Only leave the boat if it is in a dangerous position and heading towards a hazard. The reason why you should stay with the boat is because you may be able to right the vessel and get everyone out of the water. Also, rescuers will be able to spot a larger object more clearly. If possible, climb on top of the vessel to exit the water and retain body heat. Alternatively, use anything to hand that will help you remain more buoyant in the water – this will assist with conserving your energy. Getting help is the next step. The most important thing you can do before your trip, is to file a float plan and have a designated person on shore who knows when to expect you back or hear from you. They should alert the emergency services once you are overdue and they have not been able to contact you. Another way you can prepare before the trip is to ensure you are carrying proper signalling devices on board in a grab bag. Signal flares or smoke flares will assist in your rescue. Make yourself as highly visible as possible by wearing bright clothing. Try to make the vessel appear larger on the surface by tethering objects to it. Make sure to save the flares for the moment when they are most likely to be seen by rescuers. If you do not have any means of communication or signalling devices then it becomes a little more difficult to attract attention. As mentioned above, try to make yourself and your capsized boat as highly visible as possible to rescuers. Be prepared for a boat capsizing by making sure you have a grab bag on board with emergency signalling devices. Make sure you file a float plan and have a designated shore support person. On board, make sure items do not shift around and accidentally capsize the boat.